PWM fans receive their spin rate orders from your PC's motherboard. 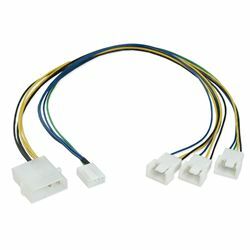 If you have multiple PWM fans, you can use this cable to sync them up to spin at the same rate. One 4-pin connector allows the connected fan to provide RPM feedback to the motherboard.